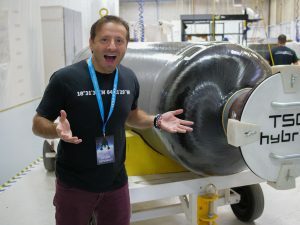 Last week I headed to the Mojave Desert to tour Virgin Galactic. I’ve been with them from nearly the beginning, back when they opened up tickets to the public. I’ve held my ticket since 2007 – so 10 years now. Some of you may remember the crash that happened on October 31, 2015. Seeing everything at the factory made me realize how hard it really is to get into space and the work that is involved to make it safe and commercially viable. I toured the factory with a handful of other “future astronauts” and got to hear their stories. That’s the tattoo on his left arm of the “DNA of flight” – part of Virgin Galactic’s logo. I’d say that’s a resolute yes. 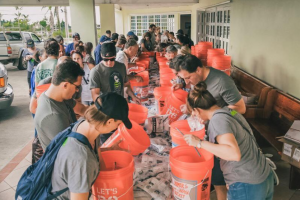 It’s also an interesting lesson in how deep the commitment is with communities when there is a bigger mission or purpose. This is something I talk about often in Evolved Enterprise. 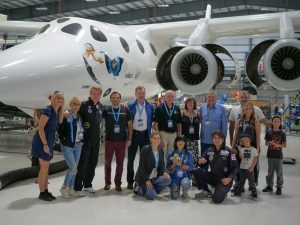 In the photo collage, you can see me and a few of the others who sat on a panel for a “lunch and learn” session for the team at Virgin Galactic. They make it a point to hear from each future astronaut about their WHY – why they signed up and why they are going. This really connects the workers with a bigger mission and purpose. One of the team members asked the panel how they thought spaceflight might make us start thinking of a greater impact in the world. Obviously I loved that question. Astronauts who have returned from their space missions talk about the “overview effect” – seeing the world as this precious and incredible treasure from space. They don’t see the country borders or any political compartmentalization – just one world. I mentioned that when you travel, you gain a new perspective on cultures and a deeper understanding of others. It was my hope that seeing a new, elevated perspective would get us to apply our skills, networks, resources, and talents to serving the world and living our legendary legacies. One of the entrepreneurs sitting next to me was profoundly inspired by this and realized he needed to change what he was doing with his work. After an incredible Camp Maverick, I woke up at 4 a.m. to catch a flight to Raleigh, NC. My wife, Missy, was kind enough to pack up the kids and drive halfway to SC to pick me up. We got into Isle of Palms late in the afternoon to get ready for the big show the next day. The weather outlook wasn’t great at all, but I had hope. And in fact, it couldn’t have worked out better…. As the eclipse started, we got a few glimpses of the sun through the clouds. Because it was so cloudy, you could see one the greatest “cosmic coincidences”—that the moon is 1/400 the size of the sun and 1/400 the distance to the sun. It’s this amazing ratio that allows us on Earth (and actually nowhere else in the solar system) to see this galactic alignment. 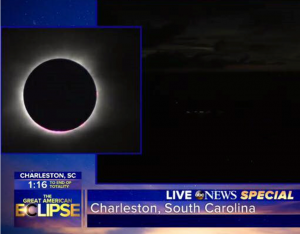 Full totality started at 2:46 p.m., and just a few minutes before, the clouds actually parted, and the crowd on the beach cheered. I got to see the “diamond ring” and then total eclipse! Wow! The kids were more impressed than they thought they would be listening to Dad get excited leading up to the event. I had seen a picture, and I was still in awe. Totality was gone too soon but was definitely an incredible moment I won’t soon forget. Plus, the symbolism of the eclipse for me is taken from different sources. Here’s the doodle I drew in my journal that day. 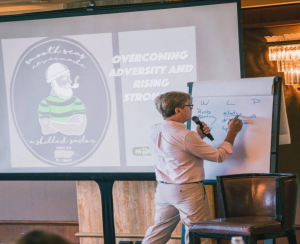 And I’m fully on board to use this reset as a way of diving into my deepest alignment of catalyzing the catalysts to change the way business is played…. After finishing this blog post, I wasn’t so sure I was going to share this whole story, so I’m posting it before I change my mind. 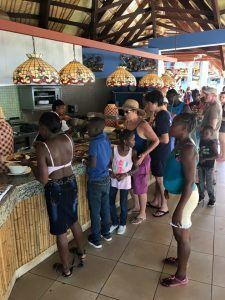 I live by the intention of “creating impact by catalyzing the catalysts.” And I’m thrilled to see that intention firsthand in Haiti…. 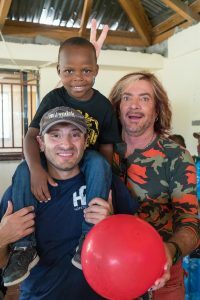 For the last six years, I’ve co-hosted an annual Impact trip to Haiti with one of my mentors, Frank McKinney. 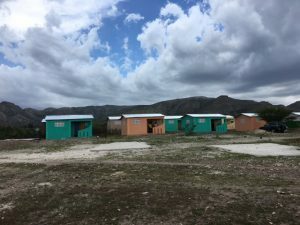 Maverick members and other invited guests have attended this trip to Haiti to develop self-sustaining villages for the desperately poor. And this visit, my seventh, was really special because it will most likely be Frank’s last time doing this trip. Secondly, it was to open the “Yanik Silver Maverick Village” in Guimby. There are only three named villages out of 24 built over 14 years, so this was quite an honor. At the tail end of a long first day after already visiting our first orphanage in Haiti, we rolled into the village after a four-hour bus ride. I thought I might feel really emotional, but it was a different kind of experience. It was certainly incredibly humbling and an incredible honor. As much as I cherish this moment, I’m also not attached to any accolades or recognition but simply doing whole-hearted work. When we arrive there as approximately 50 white people, there’s always some “feeling out” that happens. The villagers are trying to figure out how to interact, and we are too. The mood got a little more open when Frank suggested I jump up on my sign for pics. Then Sophia joined me, and we put everyone in Maverick green sunglasses and a few green mustaches…even the Haitian kids. I love a bit of fun and levity in any situation. We moved to the Community Center for a few speeches. The “mayor” of the area said how thankful they were for us building a village here in Guimby, where their great-grandparents had once lived. The government hadn’t given them anything, and now they were going to use this good fortune to magnify their lives. Frank gave the next speech mentioning my role of bringing in so many individuals who have had an impact on Haiti and that I lead from the heart. However, what I was most proud of was when one of the villagers simply got up to take the microphone to say he heard my message and today he is a “Yanik.” Today he is someone who can make a difference and can help others. That was the most special part for me—to realize that this “regular” person could be empowered now to nudge others around him too. At a rest stop on the way back to the hotel, I kept feeling something pricking my foot. I couldn’t tell if I had something in my foot, in my sock, or what. I took off my shoes and socks several times on the bus but couldn’t figure it out. Getting back to my room at the resort, I realized I had stepped on a big thorn in “my” village. It had deeply embedded itself in my shoe so deep that it was just slightly poking out of the insole. So if I stepped a certain way, there would be a sharp pain in my foot. I couldn’t help but think of the similarity to a big thorn that came all the way through my shoe while on safari in Kenya. It punctured my foot and nearly caused my foot to become badly infected. But here I simply pulled it out of my shoe. Easy. It reminded me of a chapter called “Removing the Inner Thorn” from the book Untethered Soul by Michael Singer that I’ve been reading and re-reading. Imagine that you have a thorn in your arm that directly touches a nerve. When the thorn is touched, it’s very painful. Because it hurts so much, the thorn is a serious problem. It’s difficult to sleep because you roll over on it. It’s hard to get close to people because they might touch it. It makes your daily life very difficult. You can’t even go for a walk in the woods because you might brush the thorn against the branches. This thorn is a constant source of disturbance, and to solve the problem you have two choices. Essentially, the two choices are if you keep the thorn, you try to force the world to conform to your preferences to avoid having the thorn touched. Or the second option is simply to remove the thorn by being open to everything. For me, that’s about opening to let in full joy, love, and happiness. Side note: Michael Singer’s The Untethered Soul and The Surrender Experiment are absolutely excellent, and I’d highly recommend them. I had a bit of a tough time getting through The Untethered Soul a few years back. I read it but didn’t get what I needed then. Next I got The Surrender Experiment, and it seemed to flow so much easier. It’s truly an epic story of how the Universe continued to deliver even more for Michael than he had asked for, including being CEO of a public company and growing his spirituality. In fact, he makes the point that business became his ultimate spiritual growth vehicle. And I agree totally. After breakfast, we headed out to St. Marc’s Orphanage, which we’ve supported for several years now through our cause partner, HopeToHaiti. It was great seeing some familiar faces, including one especially. His name is “Big Love,” and the last two years almost nobody could get him to smile. But now, with some love, security, and a stable foundation, he’s thriving. Totally different kid. Here’s a picture of Paola Guernsey with Big Love two years ago and now today. We were treated to one of the girls singing a gospel song with such pure joy behind it. I didn’t understand the words, but I fully got the feeling of grace and love. Hearing her beautiful voice and knowing her story really hit my heart. You see, she was one of 12 kids simply found abandoned by the side of the road. I believe our boy, Big Love, was one of those 12 kids too. But this girl was the oldest, and she was in charge of venturing out to bring them food. They literally lived like a pack of stray dogs. I cried because here was someone with such an incredible gift that was almost wasted had it not been for the compassionate individuals there with us. It’s pretty likely the kids would have starved to death on the streets, and nobody would have heard her sing. I saw two of the older boys who I took jet skiing a few years back for their first time ever, Bernard and Feditov. 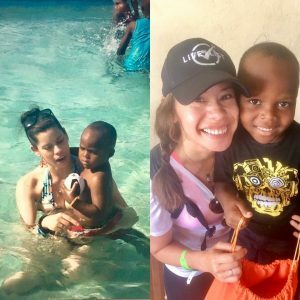 They were excited to see me since we were taking all the orphans back to our resort for them to spend the entire afternoon enjoying the pool and playing with everyone. I told them we would do it again, and their faces just lit up with fist bumps all around. Then they asked if they could drive. I had no idea, but I said sure anyway. Our family has 13 Silver Keys that are values we discuss and share each week. One of them is “Everything’s Wonderful,” which was actually the one we discussed the week before going to Haiti. Everything’s wonderful simply means you can find something that is wonderful in every situation—and it’s very much in line with the notion that Michael Singer espouses of surrendering and accepting everything that comes to you. Nothing is ever totally straightforward in Haiti. I had to go to the main office to book our one-hour jet ski session. I paid for the session, and then they had new waivers this year. I signed off and then had no idea how to sign off for Bernard and Feditov, what ages they were, or even their last names. I mean, I figured it was Haiti, so we’d be okay, so I just sorta scribbled a signature. I also didn’t know if you had to be a certain age to drive the jet ski. I really didn’t want to disappoint them, but it wasn’t really in my hands. I set up an appointment at the Jet Ski spot for 3 p.m. Great. The kids were leaving at 5 p.m., so we’d have plenty of time. When they showed up at the hotel, I told the boys we’d go at “tres hueres” in my best high school French. More fist bumps! In the meantime, I hopped into the pool with many of the other orphans. 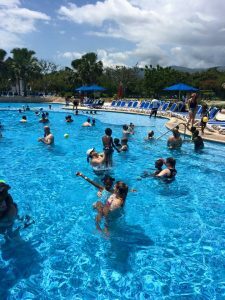 It was great because the last few years we’ve brought back the kids to our resort to enjoy just being kids. Now, at about 2:30, I told the two boys we should get something to eat. This place is all-inclusive, so I wanted them to make full use of everything. I figured they’d eat a burger or two and we’d head out. But 45 minutes later and plate after plate, we still weren’t done. The whole time, I was just smiling and loving watching them eat. The boys kept making “vroom, vroom” noises as we walked down the beach, in their excitement to drive. I was hoping they’d let them. We trekked all the way down to water sports, arriving at 3:20. At this point, our jet ski was now already out on the water. I had only booked one, but both were out. I asked the woman when we could come back, and she said 4:20/4:30. That wasn’t going to work since they were leaving at 5. She yelled something in Creole to the guys on the beach, and I got a 4 o’clock sharp answer. Looking good. Now, instead of simply waiting around, we took kayaks out and paddled around the water. I figured I’d watch the jet skis roaring around in the ocean, and when they got back to the shore, we’d paddle back there. After about 30 minutes, the two jet skis were heading back to water sports, but we weren’t all that close. I paddled hard, but by the time I got there, the jet skis were both out again. 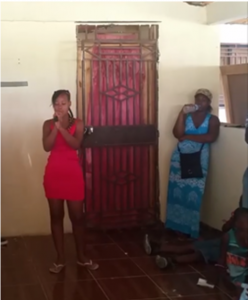 More yelling and discussions in Creole from the office woman to the gents running the jet skis. They told me it would be about 15–20 minutes, so we wouldn’t get the full hour I bought for the kids. I also know island time of 15–20 minutes would really be closer to 4:30 probably. I just told the operators I’d like two jet skis for 30 minutes instead. Done. And I asked if the boys could drive. I think he said yes, but I simply took it as an affirmative. Of course, this worked out even better because with two jet skis, now they could both take turns driving while I raced alongside them. It was great being able to reflect their joy and happiness from cruising on the water all by themselves. And the rest of the day continued with that open-heart awareness and a subtle knowing of more magic afoot. I had been hoping to see a brilliant, illuminated full moon, but nature had other plans. It doesn’t often storm in Haiti, but we got a good one. We end each trip with going around the circle sharing insights. It’s always a moving conversation as we hear how impactful and totally life changing this intense experience is. After a few more hugs, we headed out. I had been really looking forward to maybe sitting in the sand watching the full moon—but it didn’t look like that was happening. I felt a little bit of disappointment but realized there might be something better again. I like full moons for meaningful intentions. That’s why a few of us took off in the downpour to meet in Sophia’s room for deeper conversations and to work with a unique deck of Mayan cards I brought. 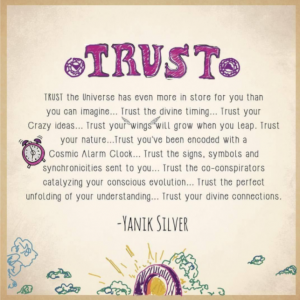 These cards are based on Mayan cosmology and are intended to help you step into your greatest expression of yourself by aligning with the bigger, unfolding cosmic story. These are not like a Tarot deck or really anything else I’ve seen or explored. Quick side story: I first started being more intrigued by the Mayans as 2012 approached. It reengaged my interest in many of the things I enjoyed as a kid, like studying the sacred sites of the Great Pyramids or Stonehenge. I knew the Mayan calendar was not the “end of the world” prophecy as some people in the media were predicting. I felt very called to be with the Mayans for the 2012 winter solstice, so I had our team scrap everything for the Maverick Summit we typically do the first week of December. I simply knew we had to be there at this auspicious time and place. My team thought I was somewhat crazy because the solstice was on December 21, just a few days away from Christmas. Undaunted, I said we were doing it. 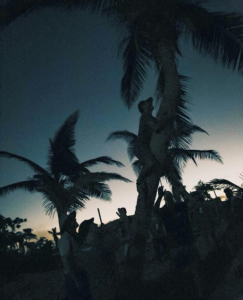 And big props to Sophia for finding a way for our Maverick group to actually spend the night in a real Mayan village on the night of the calendar change. We wanted to have an authentic Mayan shamanic ceremony for all the Mavericks staying at the village, including taking part in a temazcal. 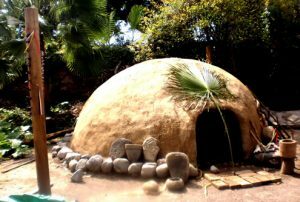 Picture a little concrete igloo-like structure that’s pitch black in there and super cramped, and then add steaming lava rocks to make it even harder to breath. There’s no way we could have planned it any better. We had come out EXACTLY at midnight on the winter solstice. This kind of synchronicity is pretty hard to brush off along with the deep symbolism of the temazcal to the Mayans, representing going into the womb of the earth to be reborn. Part of my own “rebirth” was making my own evolutionary shift from that moment forward. As I was walking from my room back to Sophia’s room, I started seeing the storm intensify with lightning. That made me think of one particular Mayan energy, Cauac, which is symbolic for storm and lightning. The first question was asked by F. about a message her recently deceased mother had been sending her. (I’ll keep the person and question private.) And just as she drew her card, there was a huge lightning strike that flashed in our windows. She drew Cauac. Next, after sharing with F. the meaning of this card, it nearly floored her because of what she’s been attempting to wrestle with in her life. It hit her like a ton of bricks because Cauac energy is all about going through a storm with no turning back and pure purification on the other side. More lightning again flashed as I drew one of the glyphs. You can probably guess which glyph I picked. Yep, Cauac too! The edge I’m stepping over with my heart opening is fully merging, teaching, and sharing all aspects of who I am: the spiritual/conscious evolution/cosmic story/artistry side AND my entrepreneurial/business/marketing side. Truly being whole with who I have personally evolved into on my own journey. And part of that is working with subtle energies through my intuition and “re-remembering.” In a private Maverick presentation on “Legendary Legacy,” I use the acronym D.A.R.E. with the R standing for “re-remembering.” That’s my wording for what we are doing here—re-remembering WHO we really are and living in a more mythic way. Interestingly enough, the next glyph drawn was about the adventurer’s quest and living your life mythically. It’s no accident that many of those amazing people we love were on the trip, including Maverick member C. I had wanted to show him the tool briefly, but now, at the airport, it might have been weird with so many people around. So be it, I handed them to him anyway. After reading through the meaning of what these cards were for and feeling into it, he wanted to work with them. I really felt into my discomfort here. The potential for being judged here felt strong. I could feel myself tightening up. If I wanted to be open, this was another opportunity to do so. What’s more, C.’s inquiry had to do with what he was planting (his words) and working on birthing. As I explained more about each of the symbols he held in his hands, tears filled his eyes. It was really powerful even if others were looking on and wondering what the heck was going on. 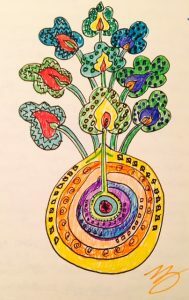 With all of this, it couldn’t be clearer to me that my intention for a full heart opening is about showing up as my whole self. I’d rather be open and really lean into every aspect of what I’ve discovered than hold pieces of myself back. And that’s something my friend, Kamal Ravikant, is helping me with. It’s a little bit of fun accountability for both of us, but surprisingly, it’s enough. 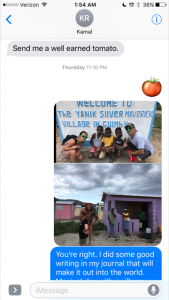 While I was away in Haiti, he sent me a text asking where my tomato was. I said I was in Haiti, thinking this would get me out of it. This concept of “hiding” some parts of yourself for fear of being judged or not being taken seriously may be holding many of us back from speaking our full truth. It reminds me of Carl Jung really wrestling with his “science” and “spiritual” side. I’m a big fan of Jung’s work and the psychological concepts he developed. Something totally different is his The Red Book, published posthumously, because he didn’t believe he would be taken seriously as a therapist if he shared everything he channeled. This oversized volume is magnificent with his gorgeous illustrations and calligraphy. This channeled work actually was the period of time that led to his greatest theories and most meaningful work. 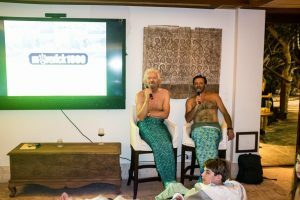 I’m back from our 9th trip to Necker Island with our visionary host, Sir Richard Branson, in support of the Virgin Unite charity. I sometimes have to truly pinch myself because I originally had written in my Life List, “Have lunch with Branson,” and now that’s turned into probably 50 lunches. Who knew? 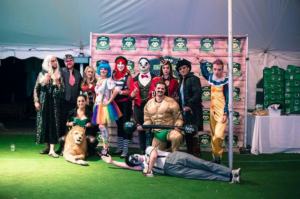 Over the years, we’ve developed a deeper bond from our shared belief that business can be the greatest lever to make a difference in the world and not taking ourselves too seriously. The outfits were for the “Under the Sea” theme party celebrating an incredible project spearheaded by Maverick #61 Mike Cline and Aydika James. 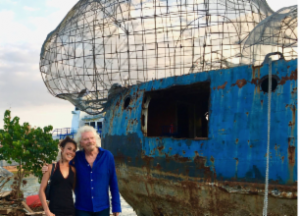 It was actually an incredible “full circle” experience this year because last year Maverick members and invited guests on Necker were tasked with how to take an old WWII Navy ship and turn it into a self-sustainable impact project. Not an easy task, but we did it! I believe the right people are in the room at the right time, and this was especially true last year. We had a last-minute cancellation, and Mike and Aydika were flexible enough to join us. As soon as Lauren Keil from Unite BVI started presenting this idea, I was so excited to see those two writing furiously. They have previous experience building Burning Man art cars, and this fit in perfectly with this project. 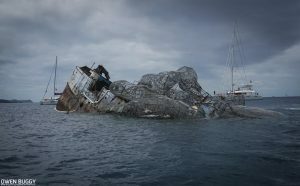 We took the YO-44 —one of the last five ships that survived Pearl Harbor from being scrapped for metal— and transformed her into a thriving artificial reef and adventure dive site. 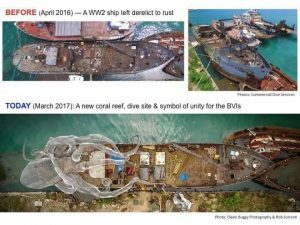 The project was designed to help rehabilitate heavily over-fished marine populations in ways that boost income for local dive operators and the BVI economy. 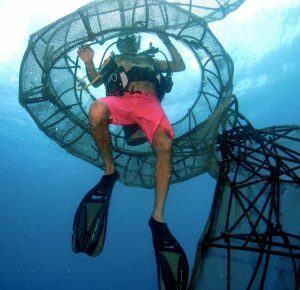 And it’s a breathtaking art sculpture used as an artificial reef, providing marine science research as well as swim and marine stewardship programs for local BVI kids. This project was featured in the NY Times, Travel & Leisure, Bloomberg, and numerous other publications for the breakthrough impact. It was amazing to be able to have started a project last year during our week and have so many of the first donors who raised funds for this incredible project right on the spot. Mavericks Jeff Siegel, Mike Geary, John Ratliff, John Carter, Matt Curry, Tom Shieh, Steve Little, Melinda Wittstock, Jim Spano, Garrett Gunderson and Sasha Ablitt were some of the founding donors. And Mike and Aydika truly dropped everything to ensure this project became a reality. The degree of coordination and partnerships to make this happen was truly incredible. There’s a big lesson here because only an epic project like this can garner this type of support. The ship was supposed to sink well before our week on Necker, but Mother Nature had other plans. So a few days into our trip, we braved stormy rain and wind to see the ship off. Richard joined us for this amazing three-hour-plus celebration, and as the clouds cleared, our anticipation grew. We weren’t sure how long it would take to sink the ship or if the giant Kraken sculpture would even remain upright. At the end, when the ship finally sunk, it went down sideways, but the divers below were able to guide it safely to the bottom upright. Phew! Here’s an incredible short film documenting the build and sink. It fit with my intention for the week. 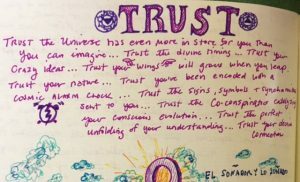 The very first day at sunrise, I wrote this in my journal after meditating. 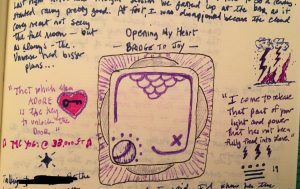 Typically, I don’t read entries from my journal, but that’s how I started off our Growth sessions and conversation in the Temple house that first morning. 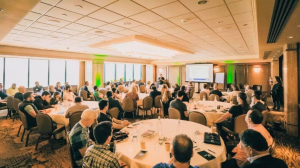 I read this entry because I trusted who was in the room, the conversations we’d have, and how the experience would shape attendees in profound ways. Typically, you come in with one intention, but you always leave with a breakthrough in some other way that you’d never expected. It was actually pretty amazing the type of conversations we had that really centered around conscious evolution and working with “invisible” aspects that show up in the material world later on. This would not have been the crux of the conversation several years ago. 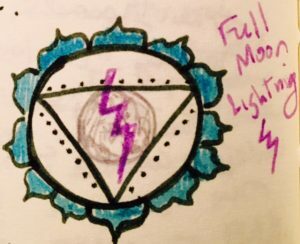 I tested my own level of comfort with having a shamanic ceremony right in the Great House on the night before the full moon. I’ve realized it’s time to actually step fully into this other part of myself too and fully align and integrate that into what we’re doing to “catalyze the catalysts” and light 1,000 suns! I wasn’t sure if it would be too “weird” or not, but we had a good number of the attendees actually take part and many more who were interested in some of the shamanic work. I’ve been meditating and doing yoga regularly now for three-plus years, and it really has started paying dividends because I was in a deep meditation for about an hour and a half during this ceremony. 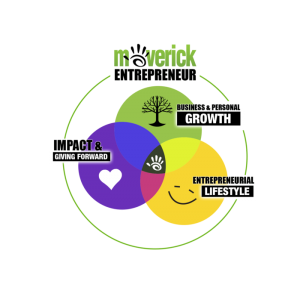 We’ve changed the dollar sign symbol to a tree to reflect this evolutionary direction for Maverick around “growing yourself and growing your business” and not simply profits. 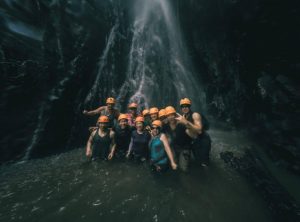 I see our retreats and experiences together as something that can be absolutely transformative on a deeper level. 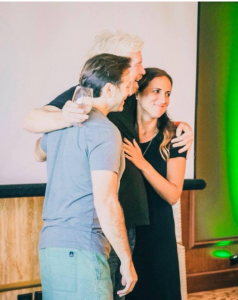 We are pretty selective with our guests and speakers on Necker because it’s more about the conversation— but I was so excited to invite Leslie Blodgett. She’s the former CEO of Bare Minerals who recently sold the company to Shiseido for nearly $1.8B. Everyone loved her. Leslie doesn’t normally speak at conferences, so this was a real special treat to hear from her. She came in when the company was pretty small, and part of her message to us was to never change being authentic to your brand and yourself as you grow and not to listen to the “professionals” necessarily. For instance, as she’s in the beauty industry, she railed against the “fakeness” of perfect models and instead used real women who actually loved the product. Leslie told us people love to connect to real people. She never had any media training and actually resisted it even when they started making more and more TV appearances, infomercials, and QVC work. The ethos was a girlfriend talking to another girlfriend. And that’s the way she ran the whole company, asking, “What would you do for your friends?” For instance, one time they had a defective brush that shed hairs all over women as they put on their make-up. Instead of waiting for customers to be upset about it and return them, they preemptively sent all the buyers a new brush. Leslie also bucked convention because she wouldn’t hire celebrity spokespeople. The whole beauty industry was “fake,” and she was going the opposite direction. She wanted that authentic zealot to be her brand advocate. And Bare Minerals was able to build an incredible group of girlfriends before we had the technology to easily do it and help spur word-of-mouth. In fact, she was so committed to the community that five minutes before the IPO, Leslie told them the news before anyone else. Once the video of Leslie’s presentation is ready, we’ll have it for you in the Maverick Members learning library. 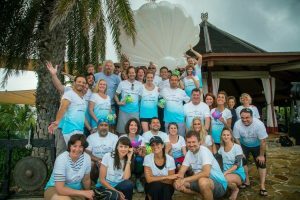 Our week on Necker raised $251,033.34 for Virgin Unite, putting our total at over $2.2 million throughout our partnership together. But it’s not just about a donation. It’s about putting our brainpower and resources together to make a difference. 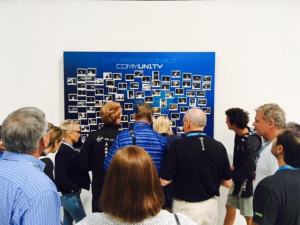 This year we were provided another challenge to take on…. The ocean is also probably the biggest business in the world. It is the world’s seventh largest economy with a GDP equivalent to US$2.5 trillion (about 5% of global GDP). Its key assets have an overall value of more than US$24 trillion. Life on Earth depends on a healthy, vibrant ocean. Without it, we won’t have a livable planet. It is an essential life system. Habitat destruction, biodiversity loss, overfishing, pollution, climate change, and acidification are together pushing the ocean system to a point of collapse. Yet despite this doom and gloom scenario, we live in a time with unprecedented opportunities for reversing this trajectory of decline and restoring ocean health. Because it’s not too late to solve this crisis. The ocean is amazingly resilient and could recover, but it needs each and every one of us to play a part. Companies, business leaders, and consumers can play a huge and positive role as force multipliers for positive change to benefit the ocean. 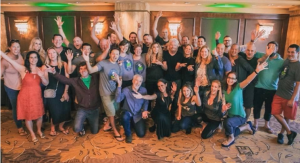 Committing to implementing a business model that is both environmentally and socially responsible, will have multiple positive effects for the planet, its people, and the global economy. The private sector is a strong and compelling voice to governments on the need to ensure protection, and it has major reach in terms of brand and consumers. Our task: to convince the world, especially the business community, that reviving the ocean is mission critical and to get on with making this happen. Just as business leaders helped drive ambitious climate action, now we need business leadership more than ever to reverse the ocean decline and put it on a pathway to recovery. 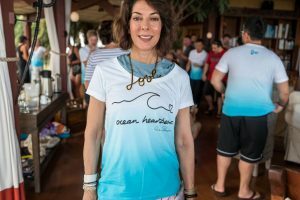 With that set-up, our task was to create an actual for-profit Evolved Enterprise that would help companies be more profitable, tell a better story, and be more conscious of being in alignment with ocean conservation. We broke off into teams, and everybody presented to Richard, me, and the team at Virgin Unite as judges. There were some great ideas, and the winner was a business model for an agency to come in and help provide a trust seal and consulting work to companies, helping them reduce and remove plastic from their supply chain. We have allocated startup funds from our donation to support and provide resources for a team of young entrepreneurs to drive and run this new venture. You’ll hear more about this #Blue project as it continues to develop and take shape. I’m also excited to say the other teams that didn’t win are moving ahead with two or three other projects as well, so we are getting more and more seeds planted for this important work! You can find out more at Ocean Unite’s new site – The Ocean is Everybody’s Business. I had another transformation this week as well. About seven or eight years ago we did a trip to Iceland and dove the Silfra Ravine, which is in between the two tectonic plates of America and Europe. 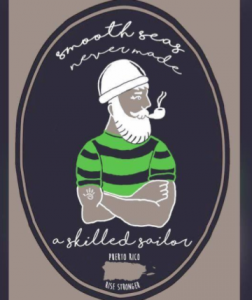 I had gotten certified a week before that dive and truly jumped into the deep end because it required a dry suit, since the water was freezing cold! I wasn’t very comfortable diving and even had a bit of claustrophobia under the water in my hooded dry suit. So I wasn’t sure if I’d dive the new Art Reef or not. Plus, I had issues before with clearing my ears and equalizing. As we dove down, I started feeling like I wouldn’t be able to do it because at 12–15 feet or so, I wasn’t equalizing. My instructor was super patient, and we just hovered and then swam around for a bit until I realized I was at the bottom of the wreck. Amazing! I was totally comfortable down there, and again I credit my meditation practice for this. It was totally in awe and had deep feelings of joy and wonder playing in and around the Kraken. It seemed so much bigger down there than on land when I had previously toured it before it sank. I can’t wait for others to enjoy this dive and see the ripple of the impact created. Being able to face this truly opened up the world under the sea for me again. It seems totally appropriate with our theme and focus during this week. 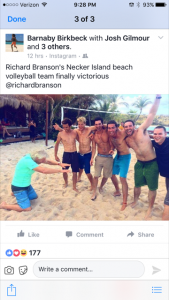 We typically end our week on Necker with the annual Patron XO invitational Beach Volleyball match of Team Necker vs. Team Maverick. We are three-time champions, and George from Team Necker had been recruiting all year to make a better showing. The game gets pretty out of hand quickly as we have a shot each time the other team gets seven points. So if you’re losing, those shots add up quickly, as they did for me. Richard was quite pleased with Team Necker finally claiming the title on their home court, as you can see. Here’s a great pic of the celebration following their victory. Next year, I’m already planning who is coming based on volleyball skills. And as a former “professional” (technically) volleyball player, I’m going to have to enlist a few big guns. And speaking of next year, we have dates for Necker set. This will be our 10th anniversary of supporting Virgin Unite, so we’re planning some epic surprises. If you want in, I’d expect this to fill very quickly. The dates are March 22–29, 2018.